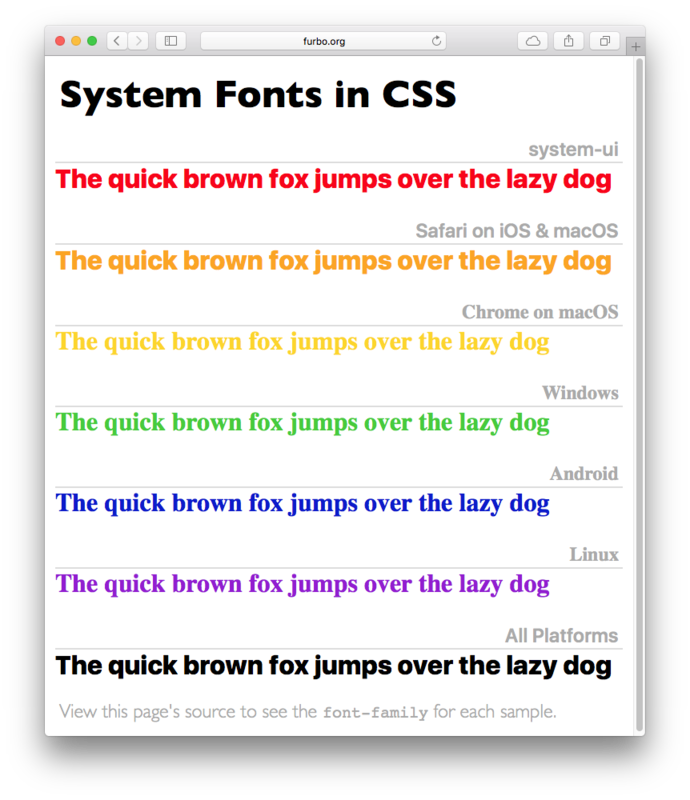 About three years ago, I wrote a piece on how to get system fonts in CSS. The San Francisco fonts had just been released and getting them onto a web page wasn’t obvious or easy. A recent tweet reminded me that I needed to update this information. The “system” generic family name doesn’t currently exist, but I’d encourage browser manufacturers to adopt this technique. At the end of the day the CSS Font Module was updated and there was an official way to render text just like the operating system. As every web developer knows, getting a feature into the spec is one thing and getting it into the browser is quite another. Luckily the adoption of system-ui has been quick. Both Chrome and Safari support it fully on a wide variety of platforms. Only Mozilla and Windows are lagging behind. If you’d like to see how this new generic font-family works, here’s a simple page that can be used to test any platform. This whole process has been fascinating for me to watch. What started as a simple idea ended up being discussed and implemented by dozens of talented engineers. The result is a web that’s better and easier for a lot of folks.